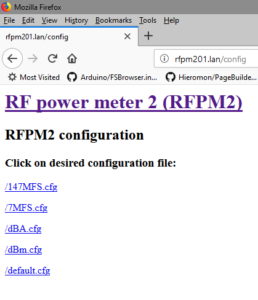 The RF Power Meter 2 (RFPM2) stores calibration constants in a file located in the (SPIFFS) file system in the microcontroller flash. The file opened by default when RFPM2 starts is /default.cfg, the following is an example. 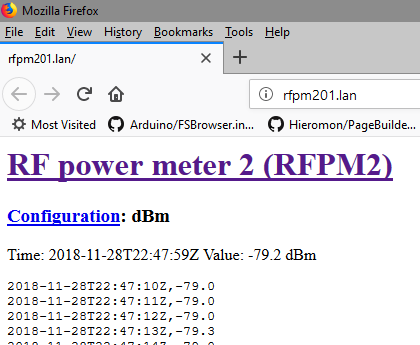 The parameters above capture the most basic operation of RFPM2 as a power meter directly displaying dBm with bar graph in fixed 2dB increments to 16dBm FSD. These values serve as a basis for some other applications as they capture the basic intercept and slope of the AD8307 module in this instance. 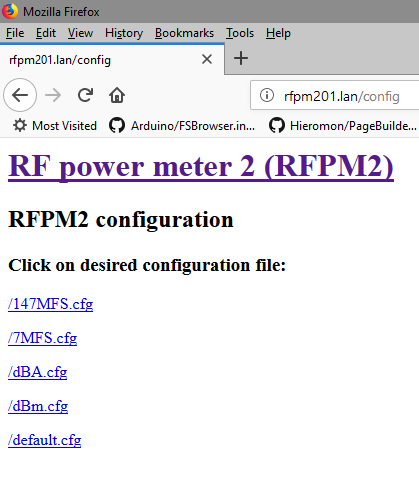 Alternative config files can be loaded on the fly from the webserver interface, for example http://192.168.0.86/config?filename=/dBA.cfg will load the dBA config file for a certain current probe. The example above shows a calibration based on the default calibration, but with a small intercept adjustment for the current probe. 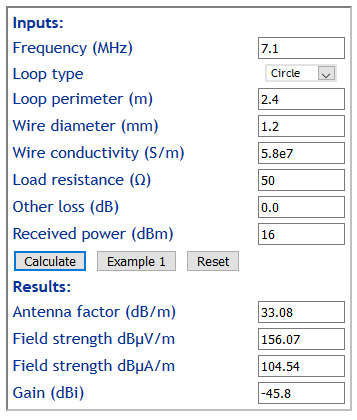 Another example is a calibration set to suit a 600mm square untuned loop at 7.1MHz attached to the RFPM2 for a field strength measurement. 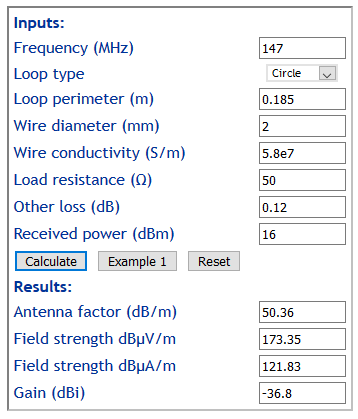 Above, we can see at 0dBm input, field strength is 141.39dBµV/m, so we want to raise the dBm calibration intercept by that amount and it becomes -91.406+141.39=49.98. Full scale deflection of the bar graph needs to be approximately 16dB above 141.39, so choose 158. 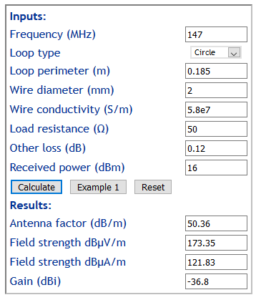 Another example is a calibration set to suit a 185mm circumference untuned loop at 147MHz attached to the RFPM2 for a field strength measurement. 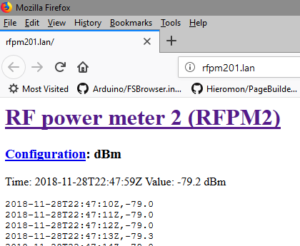 Above, we can see at 0dBm input, field strength is 173.35dBµV/m, so we want to raise the dBm calibration intercept by that amount and it becomes -91.406+173.35=81.94. Full scale deflection of the bar graph needs to be approximately 16dB above 173.35, so choose 189. Above is the web server ‘normal’ output screen at /. The Configuration link will take you to a list of available config files. Calling up the configuration URL without parameters (http://192.168.0.86/config) will display a list of known *.cfg files and links for selection.